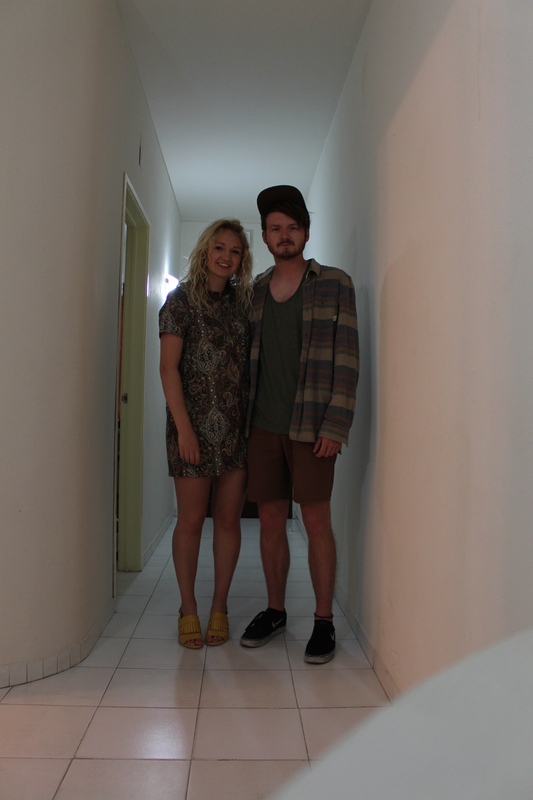 My girlfriend Becci and I decided to go on holiday to Albufeira in Portugal in June! It was sick! Portugal came out of nowhere, we wanted adventure, sun, and somewhere where we both could chill out and enjoy each others company. 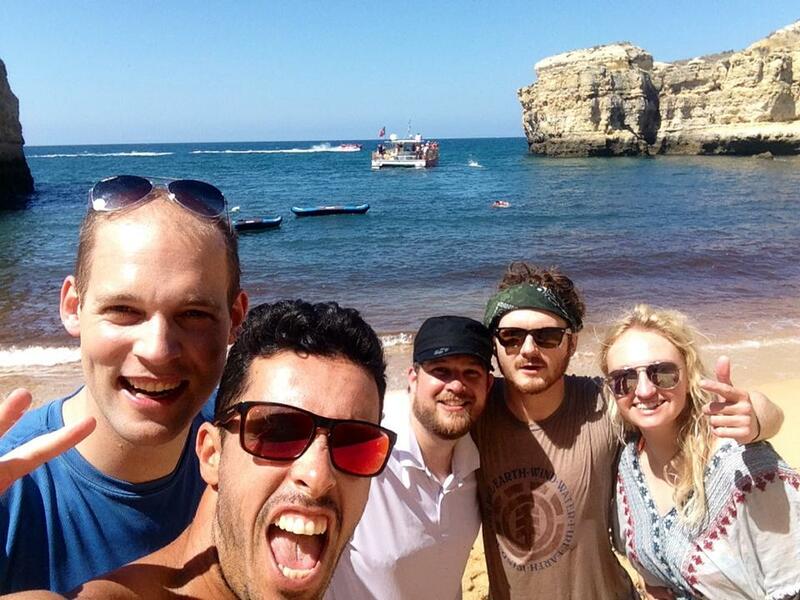 Portugal was all that and more, enjoy! Upon arrival at Faro airport I searched the sea of taxi drivers and transfer companies for our guy, there he stood, bright as a canary in his Yellowfish Tours uniform looking cool with his shades and iPad displaying our names. 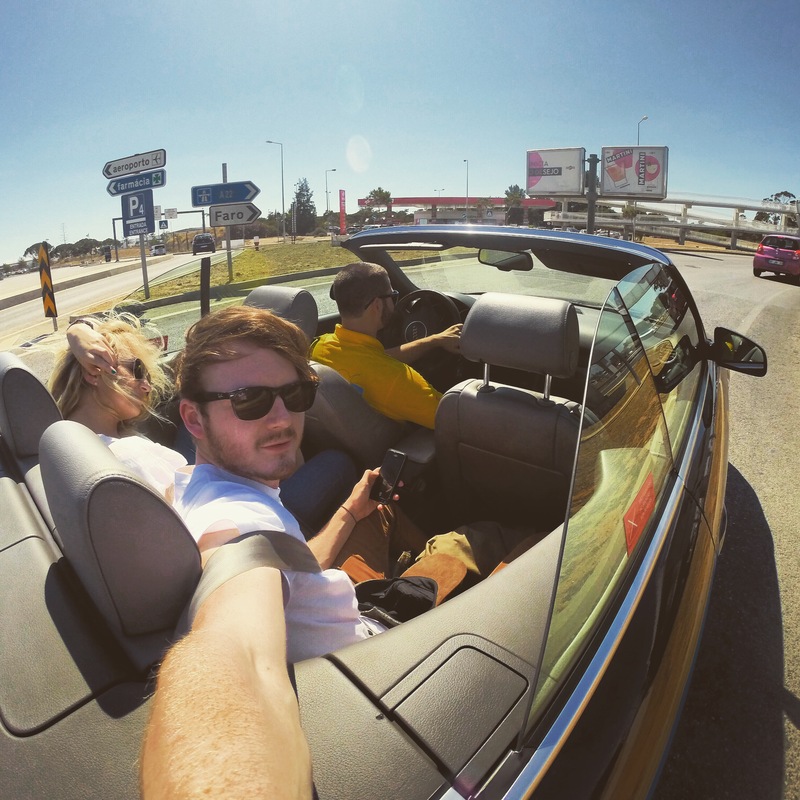 We didn’t purchase the soft top saloon ride however to our surprise as we headed into the airport carpark there stood a beautiful Audi A4 soft top plastered with Yellowfish Tours branding, this was our ride, we were stoked! The driver was totally sound, he took our luggage and sorted us out with the on-board Wifi password, which was super handy! He also give us a free gift of a small bottle of wine which we saved for later. He gave us the option to have the roof up or down, down obviously! 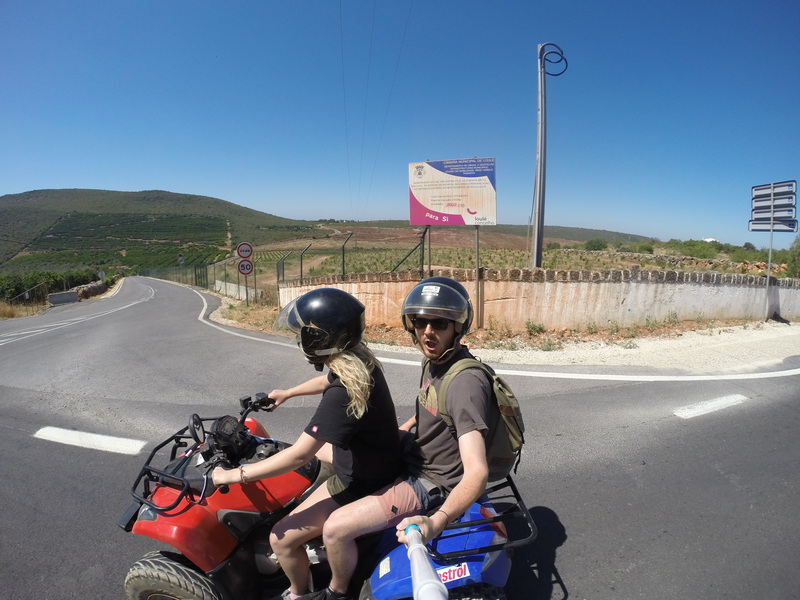 Couldn’t resist cracking the GoPro out, the journey was roughly 30/45 mins to our hotel, the sun was hot, the wind was in our hair, things were goooood! YellowFish Tours 100% recommend! Wouldn’t choose anyone else. Our hotel was the Luna Valmangude Jardim, it’s a three star hotel, it was decent but for some reason how ever many times we asked we couldn’t get a kettle or a toaster, pretty essential things for self catering! However we took a box of Lucky Charms (best cereal going) we which we pretty content with. Overall the hotel wasn’t bad, it had a fairly sized pool and sweet bar, had to pay for Wifi in your room however our room was next to reception so the public Wifi reached us! boooosh. It’s well located close to the old town and just a short train shuttle ride to the strip. The holiday was mainly for relaxing, relaxing quickly gets boring and as soon as I laid my eyes on the adventure tours and trips the relaxing soon went out the window, of course we chilled on the beach all day a few times but mainly we were up and out there! 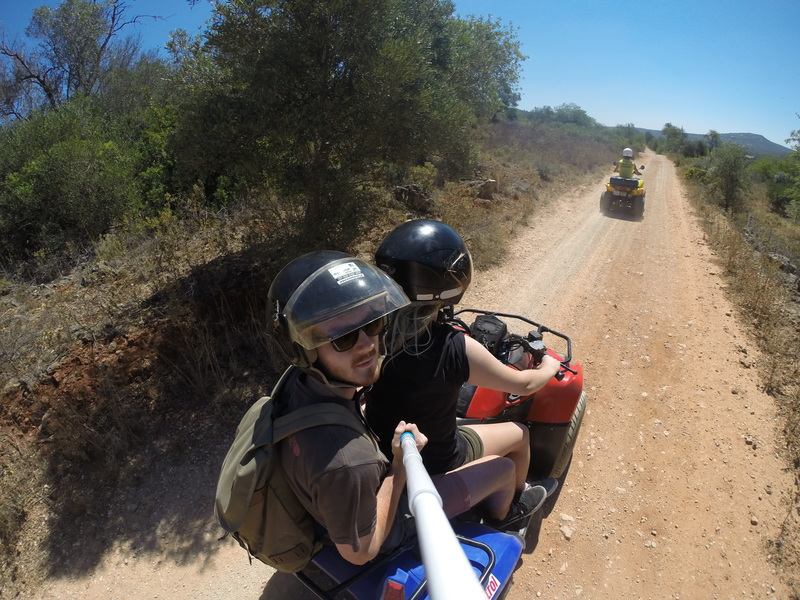 One of the trips we did was a quad bike tour of the countryside with Quad Experience, this was spot on, we got picked up from our hotel in an old minivan, everything was rattling and the ride was bumpy, it took around 30 mins to get to the quad bike pickup. Once arrival we signed some forms and paid the guys upfront, they asked about any previous quad experience and who would be riding. We had a few goes around a practice loop whilst they watched us and as soon as we knew it we were out on the road. Bec and I were both driving so we’d stop every now and again to change driver, they were cool with that and encouraged everyone to have ago. After some dirt tracks and epic views of Portugal’s countryside we stopped in a small town for a quick break, it had a natural swimming pool which was super cold! The other couples weren’t to fond but we were straight in no doubt! This place was super cool and helped cool off and refresh before going back out on four wheels. Our tour guide was so friendly (I’m ever so sorry I forgot your name) and a genius of the local area, he taught us about how crazy the growing and production of cork is in Portugal and how they harvest it. He took us through a dried up river bed where we stopped and took some snaps, he was a cool guy! Our next trip took us to Aquashow, after speaking to locals and the women who worked in the ticket shop, Aquashow was meant to be the best waterpark Albufeira had to offer. They’re weren’t far off! 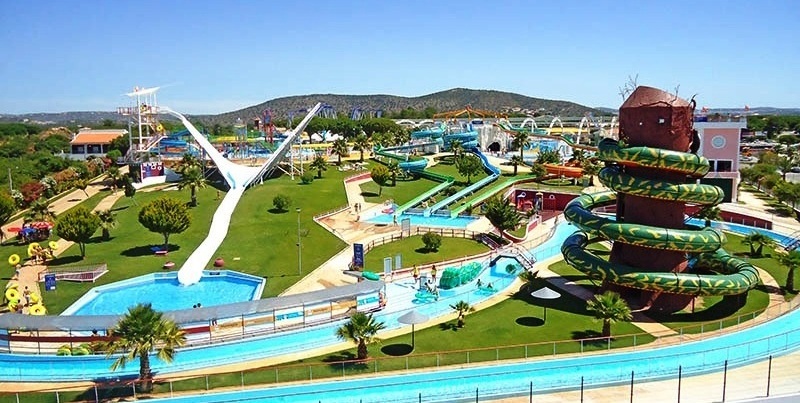 After experiencing Aquarama in Benicassim, Aquashow was on par, it had huge towering slides, a bangin lazy river, insane wave pool where nearly everyone had a GoPro, and some crazy ring rides, best of all they picked you up in a roofless bus! Aquashow had also had some animal shows, reptile, bird of prey etc. We watched the reptile show but this was weak! If it was your first reptile show it would of probably been pretty cool, I think that’s just me being unfair. After visiting shows in Florida, they’re pretty hard to beat. However hats off to that guys running them, they put the effort in! They had this experience where you could swim with sea lions for €50 euros, it was one of the main attractions of the park and featured on a lot of their advertising, however this wasn’t cool. I stood and watched the crowds gather around a what must of been a thirty metre square tank, as the two sea lions swam continuously in circles waiting for the next group of hungry tourists to join them. Sad. We chilled under palms trees most of the day continiously applying a thick layer of sun cream to protect my ginger skin, all in all Aquashow was good. 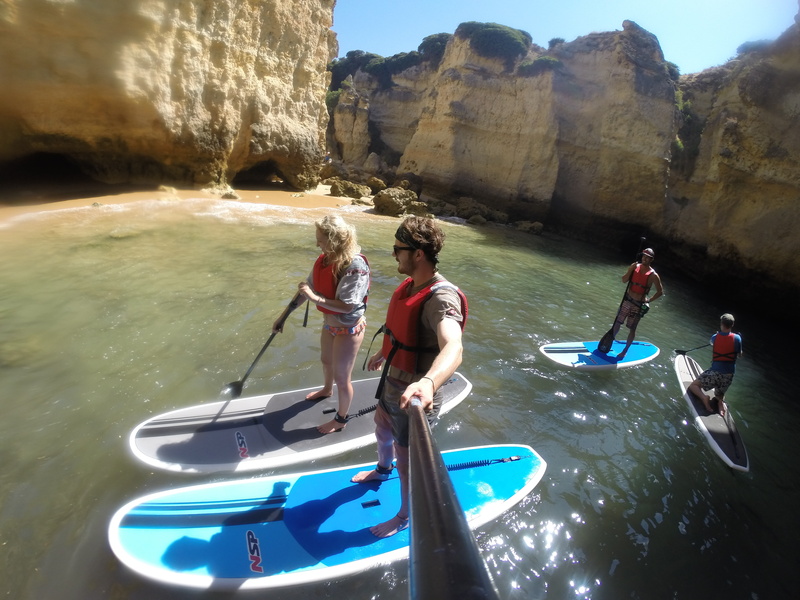 Our last trip we did was with Albufeira Surf & SUP, this was a stand up paddle boarding tour through caves and deserted beaches of the Algarve, it was sick! After the tour being rescheduled at first due to high winds and ropey waves we couldn’t help but feel anxious about this one. I had been on a SUP in the past (crazy adventure on Llangorse Lake in Wales) however Bec was a SUP virgin. 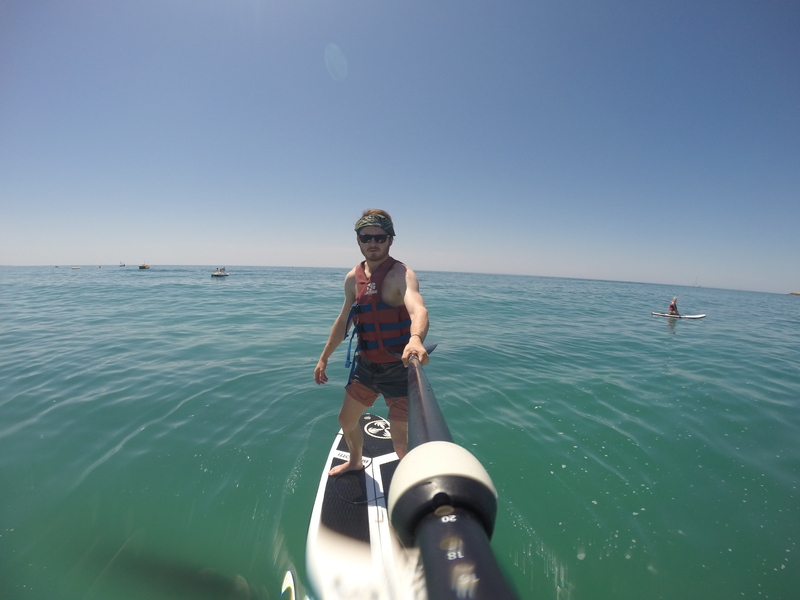 The day prior to the tour we decided to hire an inflatable SUP each on the beach, this was a total disaster! 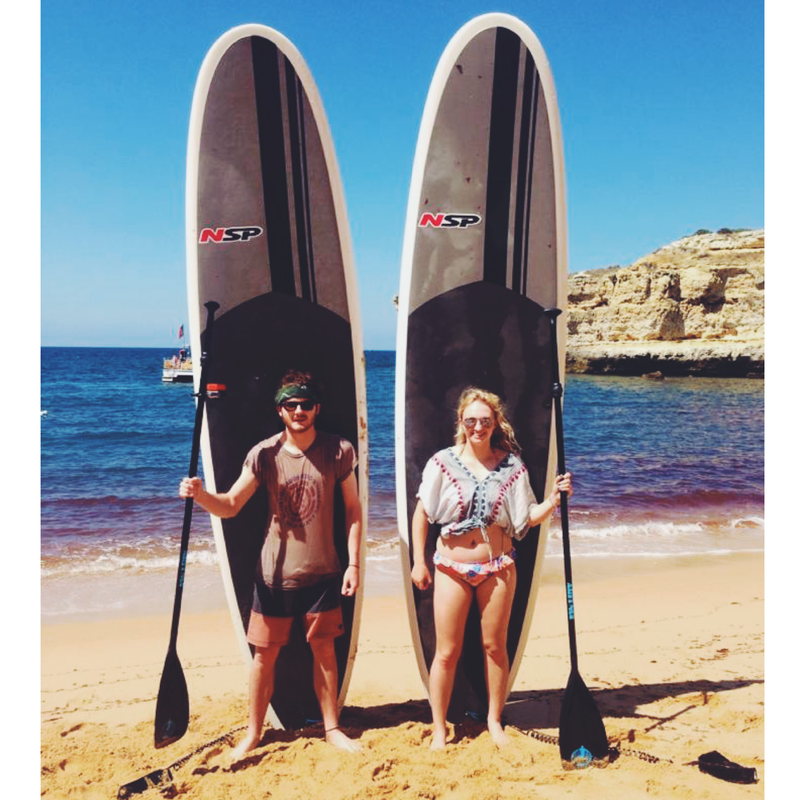 The waves were ropey and the paddle boards were thin, not ideal for beginners! I think we both managed to only just stand on them for a short time before we plummeted into the water keeping us afloat. 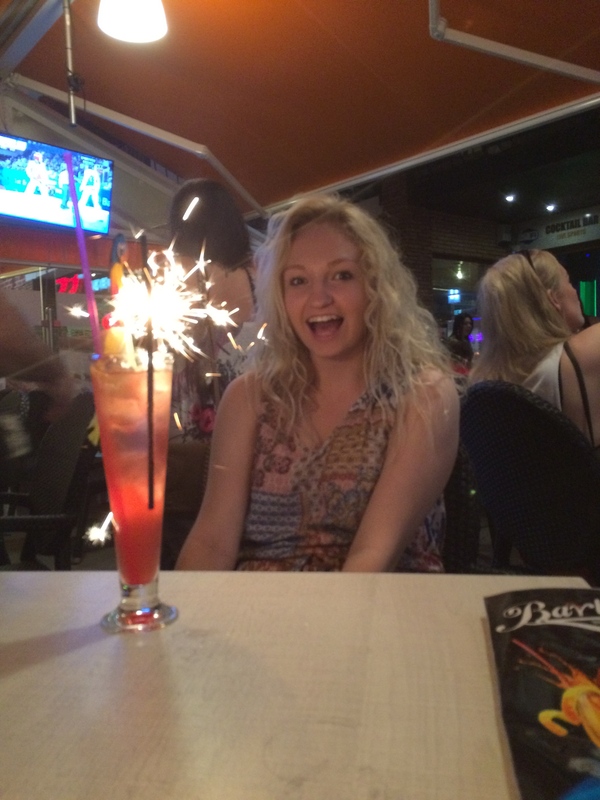 Here’s a GoPro shot of a very wobbly looking me! 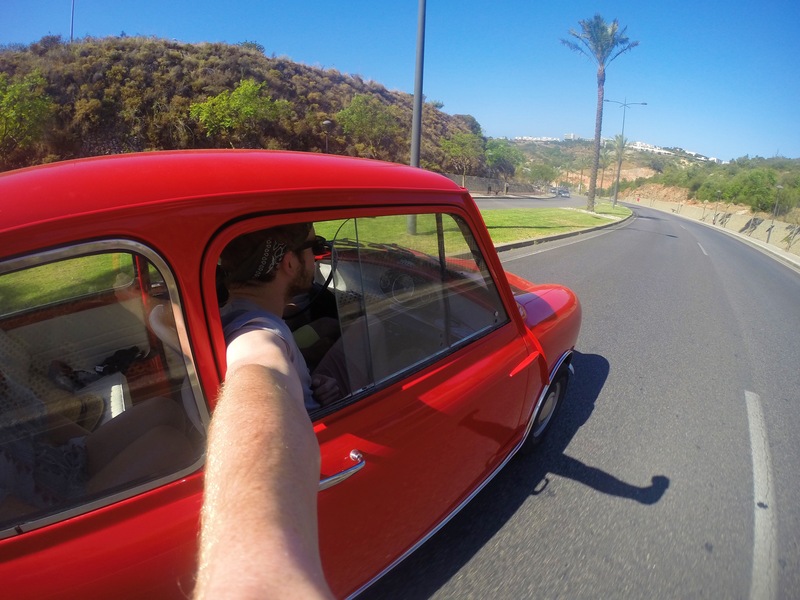 The tour began with a cool guy named Joåo, he picked us up from our hotel in his 1969 mini cooper, this was insane, it stood at waist height in all it’s glory and was 100% the coolest car on Albufeira roads. We both cramped in, Bec in the back myself riding shotgun, Joåo explained and gave some details about the waves, weather and what we’d be getting up to on the tour. The beach was roughly 15-mins drive, but it was the coolest drive yet! We got to the beach and we’re greeted by Joåos’ colleague, Mauro, as well as two German guys who were rocking the tour along with us! They were cool, and we shared past SUP experience stories, they seemed on point with their SUP, I couldn’t help but smell competition in the air. 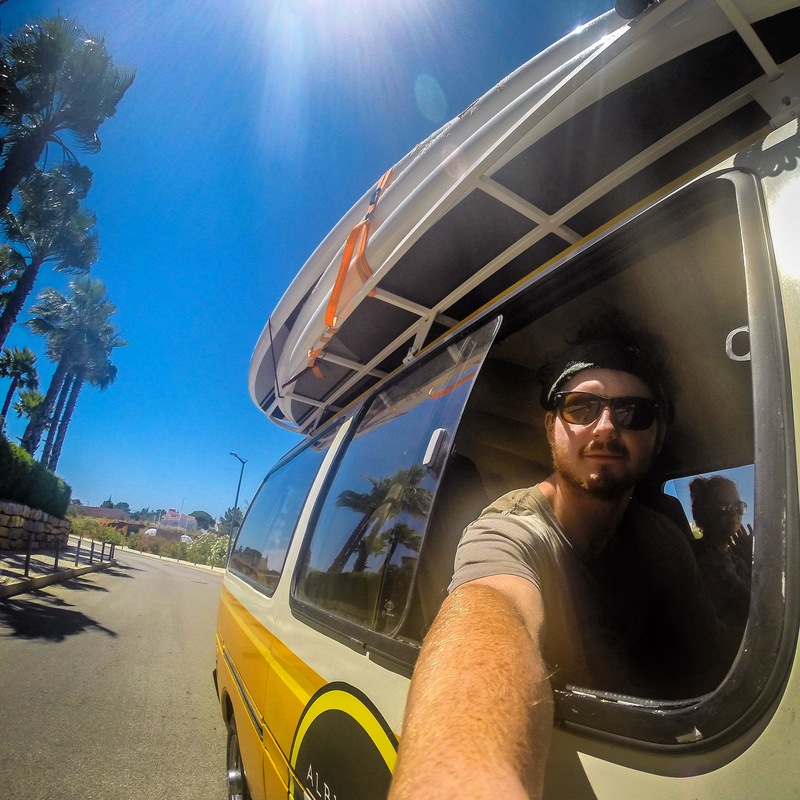 Mauro was another cool surfer guy, he was unloaded his epic surf van when we showed up. He showed us the boards and gave us life vests to wear, we talked GoPro mounts and camera angles on the paddles, and set up for some shots. The tour took us through caves and deserted beaches, it was insane, Bec absolutely nailed the SUP control and was the only one not to fall in! Brutal on us lads! Mauro was spot on and showed up different SUP techniques and how to overcome obstacles and manuvers. All in all it was excellent! I’d love to do it again. Mauro dropped us off in the surf van after the tour which was pretty neat. Below are some shots of the rest of our adventure, please leave comments, enjoy!